Curious as to why you would expect the car to be mid-pack finisher? 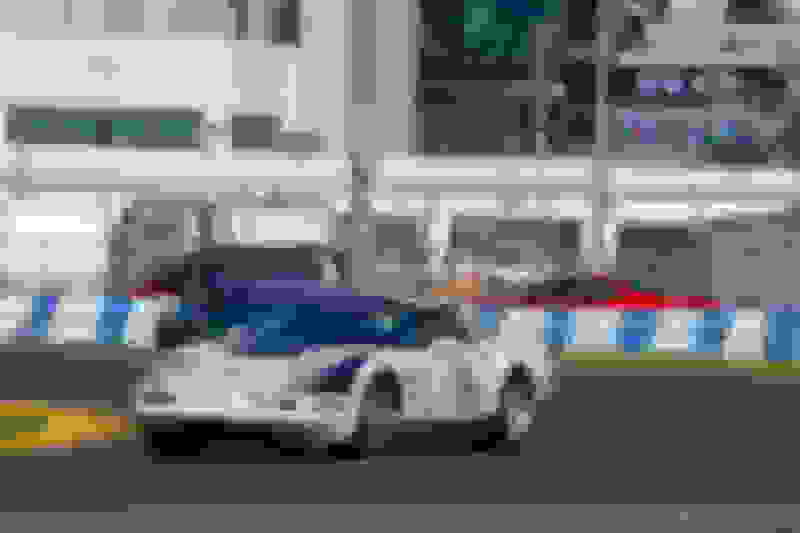 As somebody who has raced with Chump/Champ, in a Corvette, I have an idea of how well Corvettes run. They are definitely not equipped to go battle with the Miata/E36's that run. Last edited by ChumpVette; 12-31-2018 at 12:53 PM. interesting. i have zero experience with this and your comment, which is obviously based in experience, begs the question, can u give examples of the weakpoints in the c4 vs a miata or e36 that would fail or whatever? It will depend a lot on what year of Miata we're talking and which version of the E36, as well as mods done to the motors of each. An L98 C4 will destroy a stock older Miata on any road course. That's not up for debate. 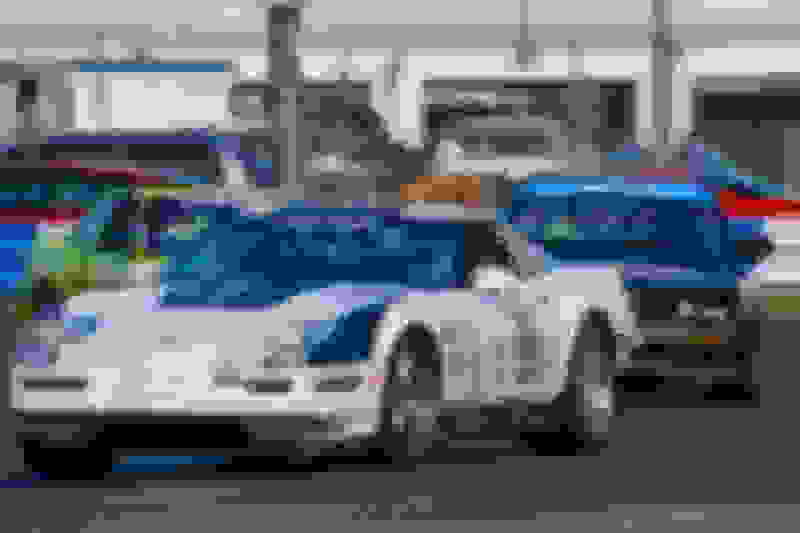 I watched a Showroom Stock race back in the late 80s and a C4 driven badly by a car dealership owner beat an gen-2 RX7 that was really well driven. The RX7 would pass the C4 in the twisty parts of the track (this was purely due to driving skill, not car ability), and the C4 would just pass him back every time they got to the main straight. It wasn't even close. And early Miatas were a shitload slower even than that RX7. A brand new Miata now is probably pretty close in acceleration to an L98 C4. A plain-jane base E36 was also slow as hell. The M3, OTOH, was lot quicker and would probably be very close in acceleration an L98 C4, but the edge in cornering grip should still go to the C4 (stock vs stock). As soon as you start making mods, then it all goes out the window. I have some experience with endurance road racing, and I have been doing my research on the C4. 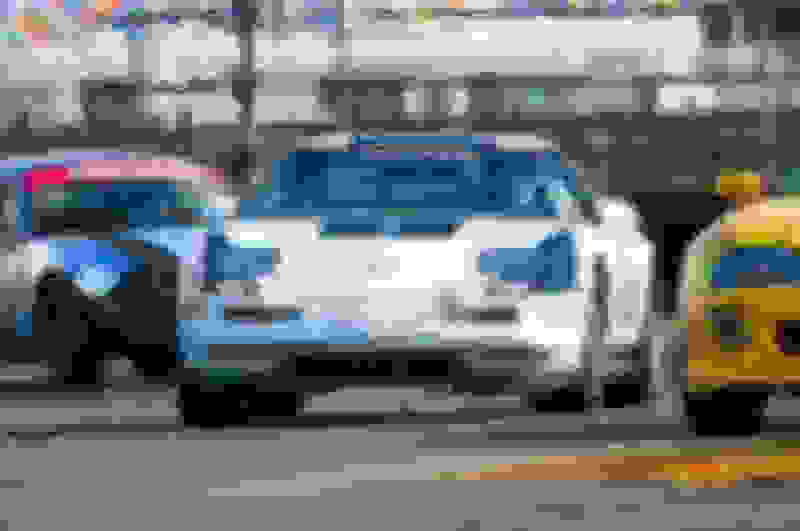 In the past two years I located about 10 instances where C4 ran in ChampCar Endurance Series. None of them finished well, most in the bottom 2/3 of the field. Two of them had competitive lap times which is a good indicator of potential. In the 11,000+ miles I have run with my Saturn SC I have routinely finished ahead of the majority of BMW and Mazda products - with overall podium finishes and class wins in three of my past five races. The key element here is not just single lap speed but reliability. Believe me there was a lot of engineering and preparation required to make a Saturn run near the front. So to somewhat address your question I don't believe the E30, E36 (excluding M) or Miata are better performing cars for single lap performance otherwise I would be building one. 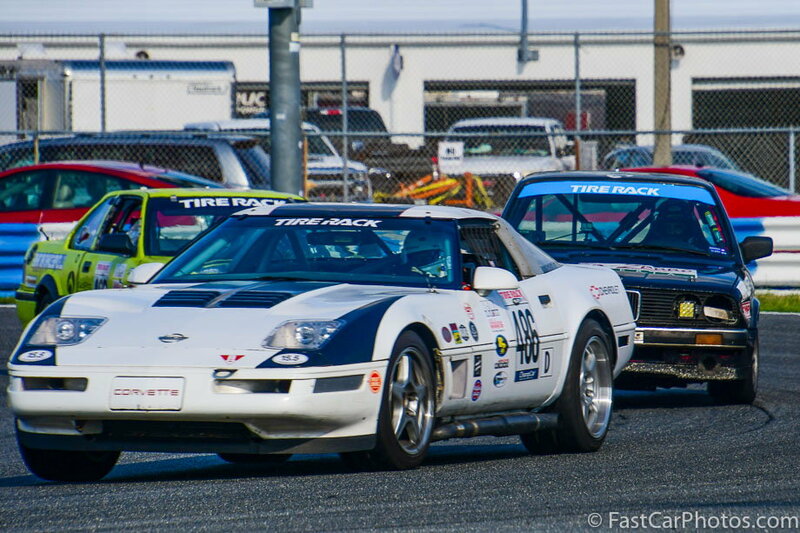 In fact the SCCA banned C4s from showroom stock in the late 1980's creating the Corvette World Challenge cars. However these other vehicles have a lot of out of the box performance which attract a lot of teams to use them as a platform. There have been precious few Chevy V8s that finish these endurance races without issue, which is not a problem for most of these others. Also there is a cost factor. The Vette has a bigger engine and is heavier so it will eat more gas, tires, brakes. Like you I am very curious the practical problems with running these in endurance road racing. 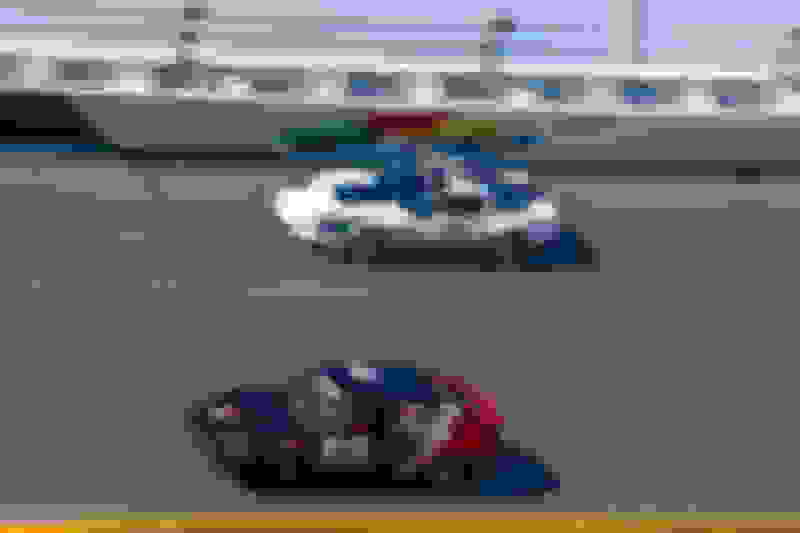 Kubs here on the forum has a 1990 set up for road racing, I am not sure what class he runs in. Mostmint, Kubs lives over in Portage Lakes. What almost all of you forget, there are different series. Champ/Chump is set up for 7-24 hours of racing. What somebody has for track day sessions for 30 minutes or SCCA for 45-50 minutes does not equal success for 3 hours or up to 24. Corvettes & Camaros have not done well in the series or any of the others due to a host of issues. 2) V8's consume a ton of fuel. Just because you can go fast doesn't mean you will make up that time on a pit stop. A corvette with a stock fuel tank will not go 2 hours (max stint length) unless you add a fuel cell. You start adding a fuel cell, you can only add 2 gallons (If I remember correctly), so max capacity is now 22 gallons. That might get you to 2 hours, but probably not. The miata and E36 with smaller engines consume less fuel over the 2 hour stint. Spend less time in the pits fueling. 3) Heat control. This is the enemy of [b}ANY[/b] endurance team. V8 will require bigger rad. The factory radiator and the rinky dink oil cooler will not cover it. You need a power steering cooler, you need brake cooling, you might even consider a trans and diff cooler. Remember a V8 creates a lot of heat in racing. And also remember, you've got no money to add these things if you want to "race" in their class. 4) Oil starvation, oil pan is not suitable, need a Canton or a Accusump, remember, it's value add and you can't spend the money. 5) Tires. Popular sizes for these endurance racers are 15/16" tires. Narrow tires. 255/55/16 or any 17 or 18 didn't exist until recently in the popular tires built for these classes. "Direzza's". V8's also love to chew up the rear tires. And since they are nose heavy, they love to eat up the fronts too. There are more points, but these are the highlights. So Matthew, I would love to see you build a crapcan C4 and come out and try to see how well you do, "fitting" into the rules of budget racing. You can build a C4 race car, just don't expect it to be competitive in this world of endurance racing. I wasn't disagreeing with you. Again, I was just comparing stock to stock. Like I said, as soon as you start making mods it all goes out the window, and implicit in that would be that rule sets have a big influence on what can do well. By starting the car above the point cutoff, they've basically legislated the C4 out of contention right off the bat. In terms of value, that doesn't compute because a C4 is about as budget a car as it gets if you don't start with a mint one. Same for the limits on fuel cell size: that's basically a direct legislation against more powerful cars. A C4 isn't nose-heavy at all, and it isn't much heavier than an E36 but it is much heavier than a Miata. And yeah, you can't do the radiator if you can't spend any points, and that is most definitely a necessary item even for short track sessions on a C4 (and most other cars, btw). So again, they've made it so that truly fast cars probably can't compete, and that's understandable. If they let the C4 compete on a level playing field it would dominate everything else that's even close in actual cost. They want the series to be a lot slower than that, and there are good reasons behind that desire. Likewise, when Grassroots Motorsports snuck a turbo onto their Miata, the series took a dim view of that. I was just pointing out that how a car fares in a class like Chumpcar is not an indicator of its actual speed and potential, and that nobody should mistake a C4 as being slower than an older Miata or E36. V8's also love to chew up the rear tires. And since they are nose heavy, they love to eat up the fronts too. Doesn't the large tire offset the weight? I don't "get" the term nose heavy. Are Miatas and Beem's rear weight biased? I wonder how the V8 would do on fuel if you kept it in a higher gear. Sometimes 100% power (high fuel consumption) only makes you very marginally faster (if at all). I wonder what would happen if you stuck it in a high gear and drove it like a "momentum car" (a miata). This would also lower the burden on the oil pan, oil temps, and cooling system. Last edited by Tom400CFI; 12-31-2018 at 07:19 PM. 3) Heat control. This is the enemy of [b}ANY endurance team. V8 will require bigger rad. The factory radiator and the rinky dink oil cooler will not cover it. You need a power steering cooler, you need brake cooling, you might even consider a trans and diff cooler. Remember a V8 creates a lot of heat in racing. And also remember, you've got no money to add these things if you want to "race" in their class. Thanks for sharing your experiences with the platform. I don't know about everyone else but I have over 11,000 miles of road racing and I agree there is a HUGE difference between a heat race or a 20 minute HPDE session and a real endurance race. I want to add that the parameters that created point #1 are changing some. For the past few years the C4 started at 530 points and therefore with penalty laps (500 is max with no penalty laps). For 2019 the base value is 450 points. If you choose to run automatic that is a 75 point deduction so you can start at 375 points. The point may still be valid I am not sure yet but now there is some room to move. For example Accusump is now 10 points, non-OE external oil cooler is 20 points, non-OE pan is 25 points, aluminum non-OE radiator under $300 cost is 10 pts. These are options. Last edited by Mostmint; 12-31-2018 at 07:22 PM. If they are changing the values, they need to update the VPI. It still lists the 84 C4 starting out at 530. I got marginalized out of Chump with their rules, mainly with the swap rules. I got tired of playing the catch up game with rule changes and finally said "F them". There are other series that want my money and don't make me jump through hoops. By the way, here is a quote from Smith on the C4. Success... we finally did it, we finished a whole event. 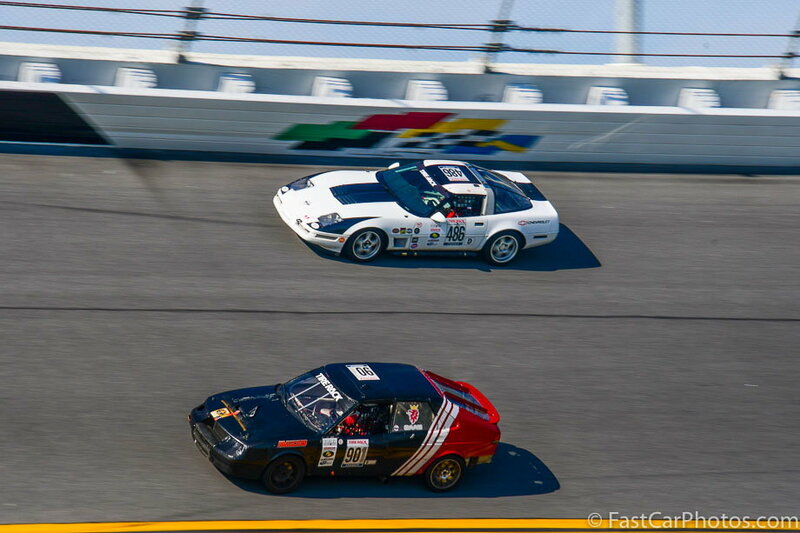 It took 4 races and 3 motors but finally the Corvette took the checkered flag. It was a long weekend with only 2 of us racing an pitting but we did it. Now back to work to fix the newly discovered issues like fuel system (we were only using 10gal of our 20gal tank) and repair some damaged wheels. I was thinking about the fuel/RPM thing more. The 'Vette team has cited the large displacement/lower RPM as a fuel saving benefit in the LeMans car. It seems like you could exploit that characteristic too...but it would take discipline. I get it. At the beginning I stayed away from a swap since we were learning how to build an endurance team. After that I purposely stayed away from a swap and from pushing the TCV to the limit since the rules were changing quite a bit. The new VPI table is here https://champcar.org/mainweb/pdf/VPITable2019v3.pdf and I presume the main table will be updated shortly since 2019 is around the corner. Congrats on the stout 2:17 lap time and getting a good run in the ChampCar race at Daytona last weekend. Was sad to see the car stopped around 11 hours - hoping it is something fixable! Thanks. We had a good run bud had to stopp when the clutch MC died on us. The car is getting there in Dec we finished the Double 7 at Sebring with just 2 drivers. This is what we do. With the FAST we can and do adjust the rev limiter and also can pull a little timing out to be safe. We can do it at any pit stop, so if a driver is abusing the car we can control it. Just lessons learned after going through 3 motors. All that stuff you pulled off if I were you ... you can sell on the forum C4 parts page and the proceeds you can use to buy things for your racecar. I noticed that you had a 35th anniversary emblem on your car. That too is worth money ... it also means it's an 1988. Last edited by 3D-Aircrew; 04-16-2019 at 10:35 AM.